Corn is a warm-season vegetable that needs bright light, fertile soil and plenty of growing space. The Native Americans have cultivated corn for over 5,600 years. Corn is a popular vegetable for home gardens. It's a common perception that freshly picked corn tastes better than store purchased ears. By planting different types of corn at different times, it is possible to harvest corn from early summer until the first killing frost. Plant most types of corn when the soil temperature is above 55 degrees Fahrenheit. "Supersweet" corn varieties require temperatures above 65 degrees Fahrenheit to germinate. To obtain a continuous supply of fresh garden corn, plant your corn varieties in stages. Start with an early-maturing variety and follow with a midseason type. Plant the main crop variety of your choice. Wait until the corn seedlings have developed three to four leaves before planting another batch of the main crop. You can plant corn right up until the first week of July. All varieties of corn are planted 1/2 inch deep in cool, moist soils. The shallow planting depth allows the sun to warm the corn seeds. Plant the corn 1 to 1-1/2 inches deep in warm, dry soil. This places the corn seeds closer to soil moisture. Create rows 30 to 36 inches apart. Leave room between the rows for weed control, fertilizing and harvesting. Space the individual corn seeds 9 to 12 inches apart in the row. Plant corn early by using row covers of clear polyethylene film 1 or 2 mil thick. This plastic warms the soil over the planted seeds. The seedlings can stay under the plastic for two to four weeks. When the weather becomes warm, remove the plastic or cut slits in the plastic to pull the plants through. Beware that unseasonable heat spells can overheat and kill the young corn sprouts. Space different types of corn that ripen at the same time at least 500 feet apart. 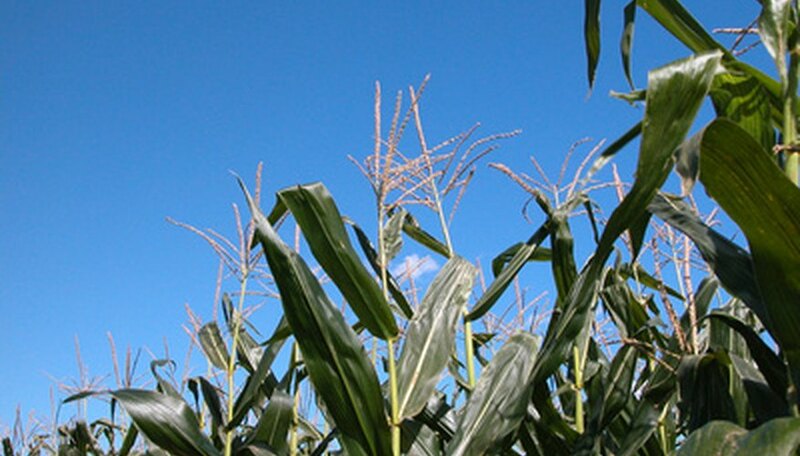 Corn is wind-pollinated and requires isolation to produce the true hybrids. Mixed pollination produces tough and starchy field corn that loses its special features. For example, supersweet corn pollinated by white standard corn will not retain its sweetness. Corn seeds are available in many different varieties. Yellow standard corn types include NK-199 and Golden Cross Bantam, which matures in 85 days. Silver Queen is white corn that matures in 92 days and resists most plant diseases. Jubilee Supersweet, Camelot and Hudson are supersweet types that produce ears in 83 to 86 days. How Far Apart Should Sweet Corn be Planted?